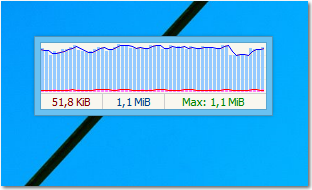 This application is a Network Monitoring tool which can account the daily and monthly bandwidth for selected network adapters on your computer. Historical data is presented in a form of diagram for both upload and download data traffic. For each of the network adapters it can show detailed information and statistics. This is a tool to monitor the utilization of your CPUs and a Network adapter (optional). 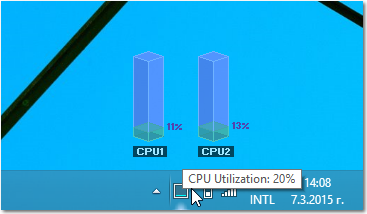 The CPU can be displayed as overview or split per CPU core. The UI is in a form of nice vertical bars which fill up in accordance to the current utilization using nice transition animations.